I had the pleasure to meet two fellow participants last night. Two thoroughly nice chaps, and a father & son team, Leo & JC. After reading about the regional meets that were going on in different places in the UK, I was starting to feel a little left out, being based in Madrid. 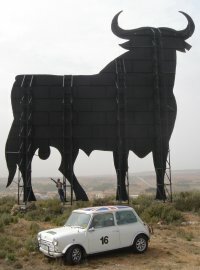 Then one evening I spotted that another rally participant also claimed to be in Madrid. A little forum banter later, and the meet was arranged. It was excellent to finally talk to other participants over a tasty beverage or two about about all things Mongol Rally... routes, cars, sponsorship. Drove down to Valencia from Madrid for the weekend of Las Fallas. Ok, so we're only talking about a 400 mile round trip, but it is the longest journey I've done in the mini. We even did some off road driving. Firstly to find a spot close to a lake for lunch, and secondly to make the photo a possibility.